January 7, 1936: Exhibition of The Ten at the Municipal Art Gallery opens. A month after the Municipal Gallery opened in its temporary location, Stuart Davis criticised the city administration's for their slowness in taking up the idea, their original policy of excluding non-citizens and the lack of a "truly democratic management" of the gallery in a paper he presented to the American Artists' Congress in February. Nearly two years ago prominent New York artists started a campaign through the Artists' Committee of Action for a Municipal Art Gallery to provide a badly needed outlet for the artists of this city. When the city administration finally took up the idea, without recognition of the Artists' Committee of Action, it opened a gallery in a remodeled private house early in 1936, on a basis of discrimination against non-citizens and censorship of art disapproved by the administration. Such reactionary ideas could never have been introduced under a truly democratic management of the Municipal Gallery by the artists themselves, which the Artists' Committee of Action had repeatedly called for. January 1936: Barnett Newman publishes The Answer - America's Civil Service Magazine. January 1936: Arshile Gorky works on Newark Airport murals. 1936 - 1941: Joan Miró is exhibits annually at the Pierre Matisse Gallery. 1936: Adolph Gottlieb joins the Artists' Union and the Easel Division of the WPA. Early 1936: Jackson Pollock's mural proposal is rejected by the Federal Art Project. 1936: Willem de Kooning moves (again). Mid to late 1930s: Willem de Kooning meets Mark Rothko. Although they had heard of each other already, Willem de Kooning and Mark Rothko actually met for the first time in Washington Square Park. (DK147) De Kooning described the meeting to a journalist in 1979, saying that it happened "one night in the park, it was late, wasn't a soul around. I walked around - thought I would sit a little bit on a bench. I was sitting way on the right side of the bench and kind of a husky man was on the left end of the bench, and I thought maybe I ought to move and sit on another bench. Maybe people would think were were a couple of old queers or something. I didn't know what I was thinking. We were just sitting there - wasn't a soul around... "
1936: The American Abstract Artists group is formed. The founding members of the American Abstract Artists, which still exists today, were Josef Albers, Rosalind Bengelsdorf, Ilya Bolotowsky, Harry Bowden, Byron Browne, Georgio Cavallon, A. N. Christie, Burgoyne Diller, Werner Drewes, Herzl Emanuel, Susie Frelinghuysen, A. E. Gallatin, Fritz Glarner, Balcomb Greene, Gertrude Greene, Hananiah Harari, Carl Holty, Ray Kaiser (later Ray Eames), Harry Holtzman, Paul Kelpe, Marie Kennedy, Ibram Lassaw, Agnes Lyall, Alice Trumbull Mason, Mercedes Matter, George McNeil, George L. K. Morris, John Opper, Ralph R. Rosenborg, Louis Schanker, Charles G. Shaw, Esphyr Slobodkina, David Smith, Albert Swinden, Vaclav Vytlacil, Frederick J. Whiteman, W. M. (Wilfred) Zogbaum. (AM) Many of the original members studied with Hans Hofmann. Hofmann never joined the group but did give a lecture at their 1941 annual meeting at the Riverside Museum. Founding members who studied with Hofmann included Bengelsdorf, Bowden, Cavallon, Diller, Holty, Kaiser, Matter, McNeil, and Vytlacil. Members of the AAA would later include Jean Arp, Mel Bochner, Louise Bourgeois, Lyonel Feininger, William Freud, Clement Greenberg, Raymond Johnson, Fernand Leger, Sol Lewitt, Richard Lippold, Laszlo Moholy-Nagy, Piet Mondrian, Betty Parsons, Ad Reinhardt, Hans Richter, Robert Smithson and Jack Tworkov. Members who also studied with Hans Hofmann included Maurice Berezov, Nell Blaine, Fritz Bultman, Perle Fine, Robert Goodnough, Lee Krasner, Louise Nevelson, Judith Rothschild, and Ward Jackson. February 14 - 16, 1936: The First American Artists' Congress Against War and Fascism takes place. The 34 speakers over the three days that the Congress took place (at two venues - the Town Hall and the New School for Social Research) included Stuart Davis and Meyer Schapiro. Stuart Davis was elected secretary of the group. (SG19-20) Lewis Mumford gave the opening address. Unfortunately, people who like extermination dislike culture... In a Fascist form of government some one person, usually with a silly face, a Hitler or a Mussolini, becomes the model which every subject must imitate and salute... Anyone who laughs at those stupid mugs, or incites other people to laugh at them, is a traitor. March 2 - April 19, 1936. 1936: Cubism and Abstract Art exhibition takes place at The Museum of Modern Art. In addition to Cubism, the exhibition included Futurism, Constructivism, the de Stijl group and Purism. Thirty-two works by Picasso (dating from 1907 to 1929) were exhibited. During the same period as the exhibition, Picasso's recently completed work (1934 - 1935) was being shown at the Paul Rosenberg Gallery. The idea for the exhibition stemmed from [Alfred] Barr's days as an art history instructor at Wellesley College, where he designed and taught an innovative course in modern art. To a study of modern painting and sculpture, he added photography, architecture, graphic art, music and film. At that time there was no precedent for such a course; it was the first of its kind at an institution of higher learning. Cubism and Abstract Art occupied all four floors of the Museum's gallery space at 11 West 53rd Street, at that time a five-story town house leased from John D. Rockefeller, Jr., husband of founding Trustee Abby Aldrich Rockefeller. The exhibition included not only painting and sculpture but also examples of photography, architecture, furniture, designs for the theater, typography, posters, and films, for a total of nearly 400 works of art. Alexander Calder's A Mobile (1936) was hung from a flagpole above the street entrance. The opening of the exhibition was delayed for one week while Museum officials and Trustees debated with the United States Customs over the entry of nineteen abstract sculptures into the United States as art objects loaned for the exhibition. April 1936: Mexican muralist David Siqueiros sets up a "Laboratory of Modern Techniques in Art" in his loft. Siqueiros' loft was located at 5 West 14th Street in New York. Both Jackson Pollock and his brother Sande attended Siqueiros' "Laboratory" where Siqueiros would experiment with unorthodox materials and methods, including dripping, pouring and airbrushing. Jackson Pollock would use an airbrush for Untitled [Landscape with Steer] (c. 1936-7). April 1936: Franz Kline moves to Westbourne Grove in London. 1936: Franz Kline attends Heatherley's School of Fine Art and frequents the British Museum. During his time in London Kline made frequent trips to the British Museum and other museums and galleries, always carrying a sketchbook, drawing works of art and the city around him. While in London Kline kept in touch with his mother and received one pound a week from her to help meet school expenses. A letter dated August 10, 1936 to a fellow student in Boston indicated Kline's continued interest in figuration and illustration. At Heatherley's Kline's teachers included Frederic Whiting and Steve Spurrier. Spurrier was head of the Spurrier School of Illustration which joined up with Heatherley's in 1936. 1936: Arshile Gorky paints Xhorkom (Khorkum). May 1936: Franz Kline's flatmate leaves London for Singapore. 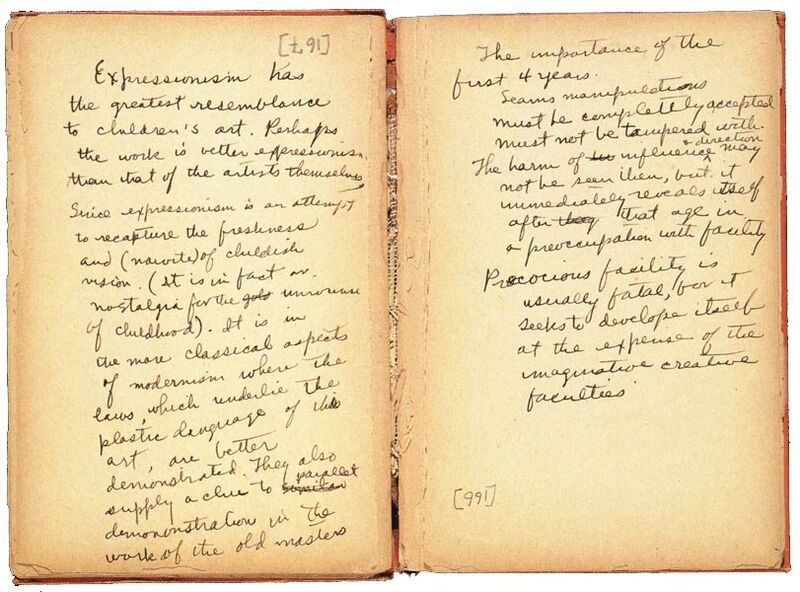 c. Late 1930s - early 1940s: Mark Rothko writes in "The Scribble Book." Two pages from "The Scribble Book"
Bound in orange cloth with the words "Scribble Book" stamped on the front in gold, this notebook - comprising 192 buff-colored pages and measuring 7 x 4 5/8 x 5/8 inches - was used by Rothko in the late 1930 and early 1940s... The "Scribble Book" jottings, the majority of whih deal with children's art and the roll of the art teacher in a child's development, may be the source of a talk that Rothko gave in 1938 at the Center Academy in Brooklyn, where he had been teaching since 1929. James Breslin, in his biography of Rothko, provides a valuable discussion of the "Scribble Book" and its relationship to Rothko's other writing and the devemopment of his ideas on art. Late Spring/Early Summer: Arshile Gorky drops Wyatt Davis photo enlargements from his aviation mural. June 15 - 30, 1936: First Annual Competitive Exhibition of the American Artists' Congress at the ACA Galleries. June 30, 1936: Barnett Newman gets married. Late June/Early July 1936: Franz Kline is visited in London by his high school English teacher. July 14, 1936: Mark Rothko applies to TRAP. July 25, 1936: Jackson Pollock attends his brother's wedding. Summer 1936: Arshile Gorky falls in love with artist Carinne West. Late Summer 1936: Jackson Pollock and Philip Guston view José Clemente Orozco's mural The Epic of American Civilization. Jackson Pollock, his brother Sande and Philip Guston and two other friends visited Dartmouth College in Hanover, New Hampshire to view the mural. (PP318) According to the Tate Modern museum, Jackson Pollock's painting, Naked Man with a Knife (c. 1938 - 1940) was "derived from a lost work by the Mexican painter José Clemente Orozco." August 1936 - 1938: The Moscow Trials are held. Autumn 1936: Barnett Newman and wife return to New York from Maine and rent an apartment in Chelsea. September 1936: Jackson Pollock has another car accident. Following his divorce in 1938, Ferren returned to the United States. He attended American Abstract Artist meetings, but felt little of the frustration that had prompted the organization's formation. After Ad Reinhardt used Ferren's name on a pamphlet passed out on the Museum of Modern Art picket line, Ferren broke from the group. During World War II, Ferren served with the Office of War Information in the North African and European theaters. By this time, Ferren had reintroduced the figure into his paintings without giving up abstraction, and following the war he turned to Abstract Expressionism. In moving from geometric abstraction to the academically based figure and still-life paintings he did after the war, and finally to the freely painted expressionist work of his later years, Ferren searched for a way to express moral truth. Throughout his life, he viewed painting as a means of seeking the reality behind appearance. His early appreciation of Kandinsky and a fascination with Zen that dated from his youth helped define the way he thought about painting throughout his life. He called art the "great common denominator between knowledge and insight," and said it should explore the intuitive - the spiritual, mental, social or psychological - forces of life. From 1954 to 1958 Ferren exhibited at the Stable Gallery - the same gallery that would give Andy Warhol his first N.Y Pop exhibition in 1962. September 14-October 12, 1936: "New Horizons in American Art" exhibition at the Museum of Modern Art. This little gem is known as Aviation Evolution of Forms Under Aerodynamic Limitations. It's a mural painting (according to Artist Arshile Gorky), which will be hung in the second-floor foyer of the Newark Airport administration building. If you look closely, you can distinguish what appears to be an airship tail at the left, but for the rest he was stumped too. October 1936: Jackson Pollock meets Becky Tarwater. October 1936: Franz Kline's drawings are published in The Artist. November 10 - November 24, 1936: The Ten exhibit in Paris. Winter 1936: Jackson Pollock meets Lee Krasner. December 1936 - January 2, 1937: The Ten have a second exhibition at the Montross Gallery. By the time of The Ten's fourth exhibition (their second at the Montross) Lee Gatch had replaced Tschacbasov as a member of the group. (AG18) Reviews of the show referred to them as Expressionists. Most commendable are the portraits by Adolph Gottlieb. With telling distortions and suggestive tones he fixes his character: whether with the wistful melancholy of Man with a Hat or with the sinning humor of the matriarchal Family... Yankel Kufeld's Night, personified by a hooded figure, is notable for its romantic strength. The review in the December 26, 1936 issue of the New York American was headed "Expressionists:"
December 7, 1936 - January 17, 1937: "Fantastic Art, Dada and Surrealism" exhibition at the Museum of Modern Art. Artists included Joan Miro, Giorgio de Chirico, Marcel Duchamp, Paul Klee, Man Ray, Hans Arp, Max Ernst, Frances Picabia, Pierre Roy, Salvador Dali and others. The article was footnoted with "The word surrealist was first used in 1917 when late Poet Guillaume Apollinaire subtitled his play Les Mamelles de Tiresias, Drame Surrealiste." Christmas 1936: Martha Kinney leaves Franz Kline.